I hope you are enjoying a break between terms. The book of Romans has been excellent for many and certainly for me. I am excited about the book of Jonah also. It’s such an unusual book of the Old Testament. Paul told the church in Rome that he was aiming to head for Spain, the vicinity of Tarshish, to take the gospel to them. Jonah heads to Tarshish immediately but it is to avoid speaking the gospel to anyone. Jonah isn’t typical of the prophet books and yet it is almost always the go to book to show children what is in the Old Testament! It’s one of those books that everybody has heard something about but the focus is always on the fish. The story, however, doesn’t make much of a deal about the fish. It’s just one part of the whole story. Most children’s books won’t talk about chapter four at all. What a shame. And chapter one has such tension and truth for us and it doesn’t end with a fish! It ends with an innocent sacrifice to save sinners! Gems like that get missed when we fail to look closely and reflect well on the word of God. This blog is to give some context to the book before getting into the text next week. I hope you find it useful. The author of the book is not given. It is titled Jonah because of the major character of the book. Jonah was a prophet of God living in the 8th century BC. The events of this book took place somewhere around 785-775BC. He was a prophet to the northern kingdom, Israel, when Jeroboam II was the king. See 2 Kings 14:23-25 for the only other OT reference of Jonah. He was a successful prophet under God even when the king was disobedient to God. Jonah was born in Gath Hepher, part of the land of Zebulun (see Joshua 19:13). Isaiah prophesied that the nations would be blessed with joy from the land of Zebulun by the birth of a prince child (Isaiah 9:1-7). Zebulun contained the town of Bethlehem. This would be the literal birth place of the mission of Jesus into all the world. This is where Jonah was sent from to spread God’s word to Ninevah. Gath Hephor is known to be a village on the top of a rocky hill – this little tid-bit will come in handy when we come to chapters 1 and 2. The next interesting, and perhaps useless, feature of these two places is that they both have relatively close links to Noah’s descendants. Noah had three sons: Shem, Ham and Japheth. Shem was the direct ancestor of Abraham who would become the father of Israel. Ham’s first son was Cush who travelled to and built the great city of Ninevah. Japheth, the third son of Noah, had a grandson named Tarshish. Now, this is a bit trivial. There’s not much more to make of it than that it is interesting. But Jonah, a descendant of Abraham and a prophet of God received the calling to go to Ninevah – a great pagan city of the Assyrian Empire (a growing world power) and headed for another pagan city, one of his choosing rather than God’s. Jonah did leave the promised land to be among Gentiles but it was on his terms, not Gods. The story of Jonah is a very short narrative. It begins quickly – the adventure starts by verse 4! It is a book about God’s mission, about God’s compassion and mercy, God’s judgement and justice, rebellion against God, about submission and obedience and about who is in control of all things. It is also a very perculiar book in the bible. It reads more like an episode of the book of Judges than it does a stand-alone minor prophet. It is a Jewish book that has little to say about Jerusalem (it does say some things and I wonder if you spot them in the narrative). It appears to read like a book for Jonah’s own benefit – he is the one who needs to come to terms with what God has called him to do. The book of Jonah is less about the message of God through the mouth of Jonah and more about the message of God through the experience and reactions of Jonah. But is is a book about the word of God and how it is needed for the whole world to hear. The four chapters can be evenly split into four sections although 1:17 would fit better as the beginning of the second section. The division is based on story arcs. The structure of each section is best to be divided into the various sections of a story – we will go through that when we look at chapter one. The story does have some ‘larger than life’ elements to it. Aside from the fish, Jonah’s character is like the anti-hero. The storm in chapter one creates a building anger from Yahweh toward Jonah. The anger builds and builds until Jonah gives in and hands himself entirely to God’s will. The prayer of Jonah in chapter 2 gives the feeling of space and quiet in great contrast to the excitement of chapter 1. Jonah is almost back in the womb before God ejects him back into the world to have another go. Jesus defined this moment as a prophecy of the three days God dealt with the sin of the world (Matthew 12:40). The big fish is sent by God to rescue Jonah. The fish is not Jonah’s punishment but his salvation from drowning. The existence of the fish and the swallowing of Jonah is simply stated and the narrative moves on. The reader understands it as a miracle and a means by which God takes Jonah back to the starting place for another go. God turns Jonah’s life around through this experience. The reality for Jonah is that his moment of salvation and thanksgiving is short lived. He returns to being the self-centred prophet that he started out as. I pray that you will enjoy digging deep into the text of this book – beyond the basic storyline – to uncover some great lessons for us today. From A Great Book To A Great Fish – Leaving Rome And Heading For Ninevah? My assumption is that most/all Growth Groups will have a two week break in line with the public school holidays. This is helpful to give the leaders a breather as well as the group members. It’s not that we go on holidays from God but that we can sustain a better all-of-year program by having these scheduled breaks. During this time, perhaps you’d like to start reading through the book of Jonah. This is where we’ll head next in our sermon series. It is a short book and so reading it several times through would make such a difference to your preparations. Over these two weeks, I aim (God willing) to write ahead for the Jonah series so that the blogs may come out in a timely manner. Please pray that I can get ahead in this way. Reading through Romans has been a great spiritual growth time for me personally. I hope that you, as a leader, have grown through preparing your group time. What an amazing book! It has sharpened my picture of God’s great plan and how we as a church fit into it. I have also loved thinking through and reflecting on the words joy and peace – both of these the world craves and both of them God gives freely and affectively if we stop and listen and trust him. On the 5th of October, at your usual Sunday church service, we’ll be celebrating the time we have spent in Romans together as a church. There will be some people reflecting on what they have learned, there will be time to stop and meditate on what you have learned and a good memorable service is being planned. We are aiming to praise God for this chapter in the life of our church and thank him for his love and mercy and abundant grace lavished on us Gentiles – who are now called saints! So, enjoy your small breath from Growth Groups and I’ll write again toward the end of this break. 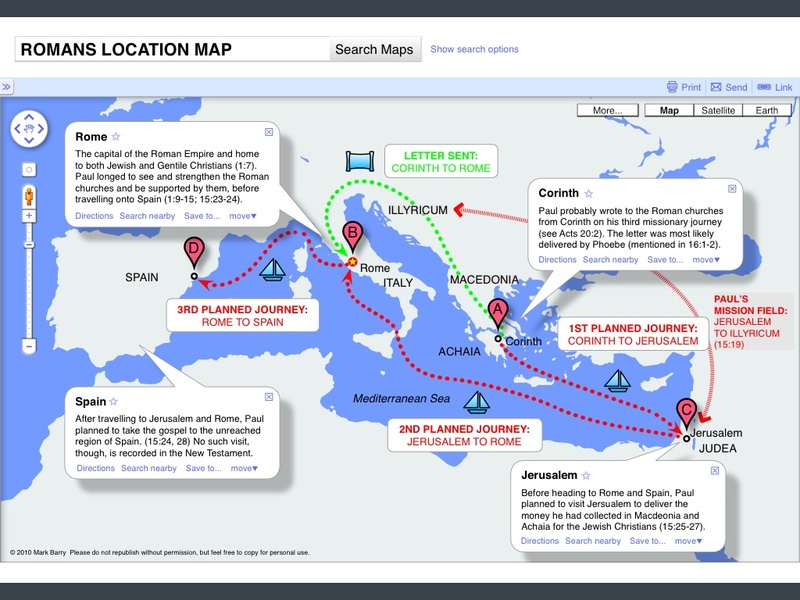 I found this map of the geography of Romans online. If you would like to look at it online you can view it here.